Maverick filmmaker Sam Peckinpah got his start in television, writing and directing for Westerns such as GUNSMOKE, THE RIFLEMAN, and HAVE GUN- WILL TRAVEL. In 1959, he created the series THE WESTERNER, starring Brian Keith as a drifter named Dave Blassingame, noted for its extreme (for the time) violence. 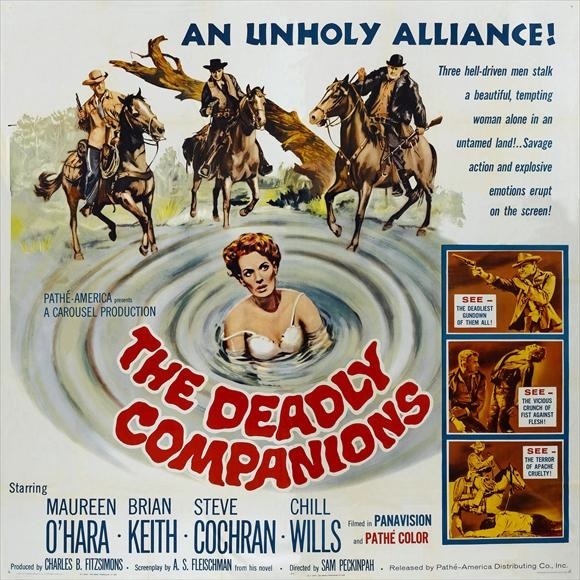 When Keith was cast as the lead in THE DEADLY COMPANIONS, he suggested his friend Peckinpah as director. This was Peckinpah’s first feature film, and the result is a flawed but interesting film which has brief flourishes of the style he later perfected in THE WILD BUNCH and PAT GARRETT AND BILLY THE KID. This entry was posted in Film, Film Review and tagged Brian Keith, Chill Wills, Cracked Rear Viewer, Maureen O'Hara, Pathe-America, Sam Peckinpah, Steve Cochran, Strother Martin, The Deadly Companions, Through the Shattered Lens, western. Bookmark the permalink.